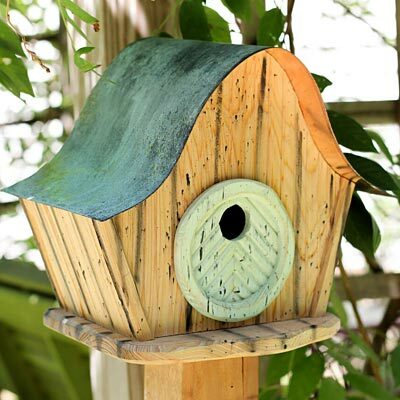 Turn your landscaping into a rustic haven by adding the Heartwood Katy's Kottage Bird House with Green Door to it. This charming piece is sure to become a favorite shelter for small songbirds, while also adding a hint of bright color to your setting. The tan body sports a wealth of painted, vertical gray lines, creating a distressed and aged look on the piece, furthered by the verdigris color of the curved, copper roof. A lime green disc with a raised edge adorns the front panel of the home, and a 1.5" diameter entry hole in this disc allows birds passage into the piece. The roof and disc both overhang this entry slightly, protecting the nest from rain, and drainage on the base allows any water to exit. The bottom platform not only provides perching area for wrens or bluebirds; it also allows the home to be post mounted using its included mounting plate. A disc on the back removes for seasonal cleaning, and the cypress body and copper roof remain hardy for seasons of use. Bring delightful color and rustic charm to your bird garden with this Katy's Kottage Bird House with Green Door. Made in the USA.